The sun was high in the sky before I realized how utterly idiotic I must look. Bleary-eyed and dressed in the airplane clothes I'd put on 23 hours earlier in New York, I somehow found myself in the complete unknown: standing on a rocky outcrop in Waiheke Island, New Zealand, surrounded by fragrant lavender bushes that rustled and swayed in the coastal breeze. I'd arrived that morning on the first ferry from Auckland and decided to go for a quick walk until I could check into my hotel. But every bend in the trail revealed a new delight—verdant rolling hills, vineyard vines heavy with grapes, quiet sapphire bays—and before I knew it, I’d embarked on a three-hour hike with little more than an eye mask and earplugs from my flight. Waiheke Island will have that effect on you. Though small in size, the island has over 30 wineries and 80 miles of rugged coastline, flecked with tranquil coves, white sand beaches, and yacht-lined bays that beckon to be explored. There’s certainly no shortage of things to do here, and it doesn’t take long to realize why this local gem has started to gain international attention. Travel+Leisure named it the fifth best island in the world in 2018, ahead of popular destinations like Maui and the Greek Islands, and Vogue went so far as to call it “the Hamptons of New Zealand,” beloved by A-listers like Beyoncé and Cindy Crawford. Waiheke’s appeal has nothing to do with celebrity spotting, though. Unlike mainland New Zealand, which attracts thrill-seekers who are eager to tear down the slopes and sling-shot through gorges, Waiheke Island draws a more relaxed, introspective traveler. Here, your only task is to slow down and appreciate what's in front of you, whether that be a picturesque coastal trail or ruby-colored glass of Syrah. I couldn’t have felt further from Manhattan standing among the lavender bushes that hug the coast, but Waiheke Island isn’t as remote as it first appears. Part of an archipelago off the coast of Auckland, Waiheke can be reached by a 35-minute fast ferry from the city. Air New Zealand’s overnight route from San Francisco to Auckland takes just 13 hours, and the time difference doesn’t leave you too disoriented (though you may be inspired to embark on a jet-lagged hike). Waiheke Island might be touted as a “new” hot spot among American travelers, but it’s been a favorite Kiwi summer destination for decades. Once a hippie hangout for those looking to escape city life in Auckland, the island has seen a complete evolution, thanks to its accessibility from the mainland and world-class vineyards that started to open in the ’70s. Now, it’s dotted with mansions owned by New Zealand’s elite, who return in peak season when the island’s population triples with vacationers. The weather is balmy with minimal rainfall from November to March, making it the ideal spot to flee the Northern Hemisphere’s chill. If you only plan one activity during your stay, it should involve sampling local wine. “Some of the best wines in the whole world are coming out of here,” says Peter Young, a guide for Ananda Tours, a local operator specializing in gourmet food and wine tours. Young isn’t exaggerating: Waiheke Island shocked judges at the International Wine Challenge in 2009 when local winery Kennedy Point Vineyard was awarded the best Syrah in the world for its 2007 vintage. “The judges couldn’t believe their eyes when they revealed where the wine was from—they’d never heard of Waiheke,” says Young with a twinge of pride. The island’s clay soil and intensely dry summers create the perfect conditions for Bordeaux-style blends. The flagship variety is Syrah (another name for Shiraz), which shares characteristics with that of northern Rhone, being subtle yet floral and spicy. White wine drinkers should sample the local chardonnay, which ripens early on Waiheke Island, creating fresh citrus aromas and good acidity, according to Waiheke Wine. Mudbrick Vineyard and Restaurant has been a must-visit since the ’90s, and its reputation holds true today. Perched atop a hill in Oneroa, the property boasts panoramic views of the glittering jewel sea, undulating vineyards, and hazy Auckland skyline in the distance. It’s not hard to see why Mudbrick has received the nod of approval from Taylor Swift and Shailene Woodley—it’s peaceful, picturesque, and completely unpretentious. The Essence of Waiheke Wine Tour by Ananda Tours includes wine tasting at the cellar door and the option to stay for lunch. Book a table by the windows at The Mudbrick Restaurant, and order the Taste of the Hauraki Gulf, an artfully arranged smorgasbord of Te Matuku Bay oysters and Bream Bay scallops that are almost too pretty to eat. Though it’s tempting to spend a day at Mudbrick, a host of world-class wineries await. Close to town sits Stonyridge Vineyard, a vine-covered restaurant and cellar door known for Larose, a Cabernet-dominant blend. In summer, the owner also hosts yoga classes on the panoramic deck and weekend DJ sets. The island’s latest flashy addition is Tantalus Estate, which received a multimillion-dollar face-lift in 2016, and boasts a winery, craft brewery, and light-drenched expansive restaurant. Then, to the far east sits Man O’ War, the only waterfront winery that’s accessible by boat. Dock your boat by the cellar door and sample its flagship Syrah or chardonnay over an antipasto platter before sailing around the rugged coastline, home to some of the more remote beaches and bays in Waiheke. If white sand is what you’re after, venture to Onetangi, the island's biggest beach located just 15 minutes' drive from the main town. You don’t need to stray from Oneroa to find something to do, though. The relaxed main town has a few great boutiques and cafes to peruse. Stop by Veranda, a stylish home décor store with a thoughtful curation of kitchen accessories, handcrafted ceramics, leather cleaning supplies, and soft linens. With a mix of Scandinavian, coastal, and cottage-inspired wares, it’s the perfect place to pick up a souvenir you’ll actually use. Next, venture to the other side of the road to Timmy Smith, a serene tea and jewelry store. The local purveyor has a great selection of Thea Ceramics mugs, fragrant loose leaf blends, and leather small goods. In typical Waiheke style, even the general store has a few high-end gems. Drop into The Island Grocer for cool small batch goods including Shared Kitchen Preserved Lemons, Manuka honey by Waiheke Honey Co., and sweet treats by Bennett of Mangawhai. It’s the ideal place to grab gourmet picnic supplies from and take to one of the small beaches nearby, like Little Oneroa. End your day in town with fresh oysters and a glass of vino at The Oyster Inn, an upscale restaurant in the heart of Oneroa. The hot spot was opened six years ago by Louis Vuitton’s former UK communications director, Andrew Glenn, who sought a chilled, unpretentious respite from bustling London. Though The Oyster Inn has since changed hands, it’s still a good spot to pause, savor Te Matuku Bay oysters, and unwind before continuing on your way. Much like the Hamptons, you won’t find mass hotel chains in Waiheke Island. There’s a better option: The island is home to a smattering of five-star boutique hotels, which retain local authenticity while offering all that you’d expect from luxury lodging. At The Boatshed, an upscale boutique hotel located minutes from Oneroa, it feels like you’re staying with friends—if your friends owned a beautifully decorated coastal retreat. Purchased in the 1980s, The Boatshed is designed to look and feel like a typical coastal Kiwanis Bach (the local term for a vacation home), complete with model sailboats, stacks of nautical books, and wicker chairs. The rooms are spacious and plush, with soft linens, a sailing mast–inspired headboard, and roaring fireplace that beckons you to kick back with a glass of port in hand. The Boatshed’s appeal goes well beyond its rooms and plush décor, though. Don’t skip breakfast, which is included in your stay. A far cry from the basic continental offering we’re used to seeing at hotels, this spread goes above and beyond, with flavorful compotes and jams, freshly baked breads, green juices, and seasonal chef–prepared savory or sweet dishes that change daily. Guests can also book dinner at the hotel, a family-style meal prepared by chef Ian Alan Sheilds using organic produce (some sourced from the hotel’s own gardens), paired with New Zealand wines. Despite how accessible Waiheke Island is from Los Angeles and San Francisco, I don’t hear any American accents while I'm there. The international buzz and influx of celebrity guests hasn't spoiled this local gem, which retains its relaxed, unfussy New Zealand attitude. 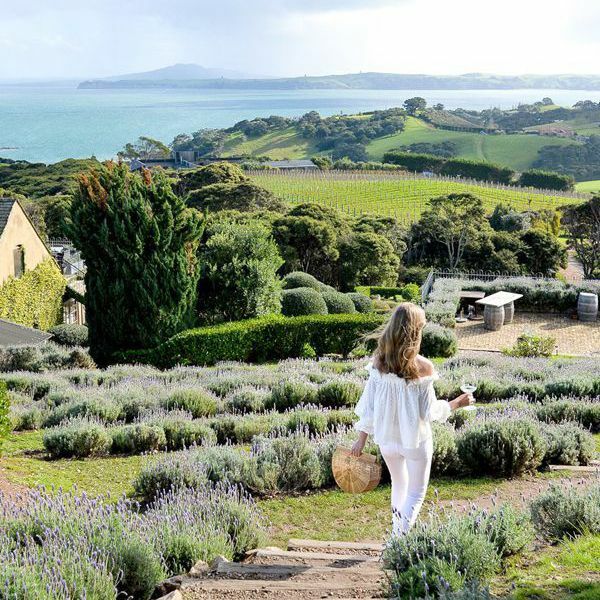 It only takes two nights on the island to learn Waiheke Island’s secret to living well: There's nothing that a coastal walk or good glass of wine can't fix. This trip was hosted by Tourism New Zealand. Editors' opinions are her own.